Monitor your engine's vitals and race with confidence while adding some style points with our ashtray gauge panel for your 1-series BMW. 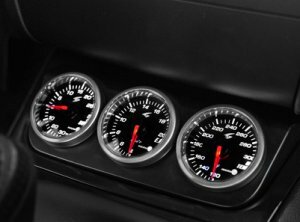 The Macht Schnell gauge panel is an exact component replacement for your stock BMWs ashtray, comfortable housing three 52mm gauges within and angled for easy viewing. The textured finish allows an OEM feel as if this were offered from your local BMW parts counter. Injection molded from ABS plastic, this panel will resist warping or bending in high-heat applications. The smooth textured finish is a perfect match for your BMWs interior, giving the OEM-like appearance you expect. The Macht Schnell ashtray gauge panel mounts using the factory ashtray mounting holes with no drilling or gluing necessary.